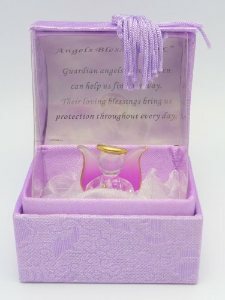 DIVINE CHRISTIAN GIFTS - Purple Guardian Angel in a Box with Angel Blessing Prayer. Purple Guardian Angel in a Box with Angel Blessing Prayer. Angel blessing in a box with an angle blessing prayer.